St. Louis Shelly has a gorgeous gray bathroom in her 1956 house. The drain of her sink has rusted out, and she needs an all-new sink. Good news: The sink appears to be a Kohler Tahoe with hudee ring, and this model is still available today in a light gray. Bad news: It will take 42 days to get the sink via special order. I referred Shelly to this post — and asked to see more photos so that we could all ogle the gray bathroom – a color I haven’t featured yet. 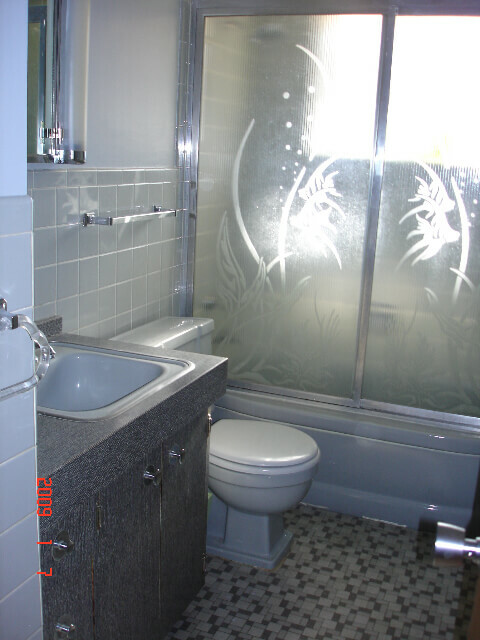 Oh my goodness, this is so beautiful – the vanity…THE FLOOR…the shower door…THE GRAY! The only thing you could need: Some wallpaper (of course!) or some print for your walls to bring in color. Once either of those are in place, you can spec your towels. Fantastic vanity! I love it! I’m not usually a fan of gray, but what I like about the all gray going on here is that you can accessorize it with just about any color. Wow! Do the shower doors have turtles on the bottom? That’s what my husband remembers from his childhood bathroom.